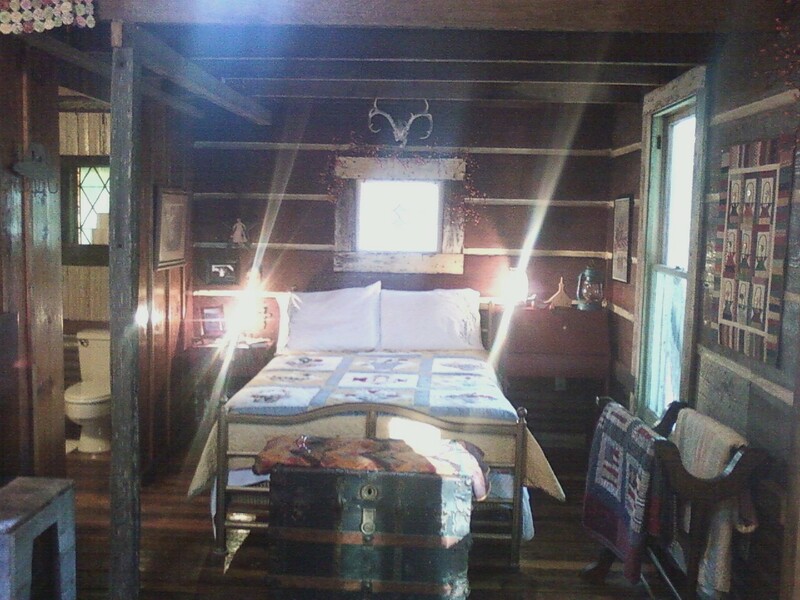 If you’ve been reading all the posts before this one, and started with “Welcome To Cottonwood Creek“, followed by “Buying a 25′ Tall Teepee”, “Age and Youth Collide”, etc…then you’d know by now that my Mountain Man husband and I had no plans to own land or build a Bed and Breakfast….but suddenly, we have both. If you already read those first few posts, you’d remember that this structure we’ve been working on has been handed to us. With the exception of very few things, all of the supplies to build this were given to us free…after we both had a very strange “vision” (idea) in both of our heads while we drove home from a brief vacation in a Bed and Breakfast in Fredericksburg, Texas. If you want to see it finished (or just about finished), then this is the post for you! Along the build, we kept receiving what I affectionately call “God winks”; these are small incidents that proved to me that we truly heard God…and that the “concept” of the Bed and Breakfast that we both saw in our heads was really from Him, and not just our imaginations or a fluke. As the previous posts explained, the God-winks consisted of things like our boat selling at just the right time to fund the water well digging, water pump and installation, electric pole and wiring, and large pond to be dug and stocked with fish. God’s next “God-winks” came in the form of all the wood and metal for the entire structure being literally handed to us, free of all charge. Then, of all things, even the simple electric “gas” lanterns being randomly given to us…only days after I thought I’d get some. There were two more God-winks. We had been talking during the building process, wondering if anyone would really want to stay here, in the woods, secluded. 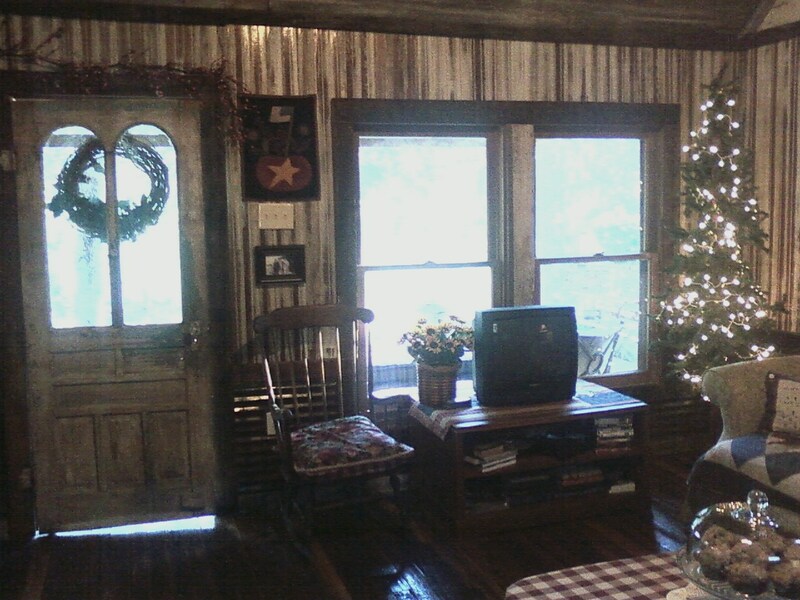 We determined it would have to be people who didn’t care about shopping, but wanted to sit on a rocking chair on the porch with tea or a glass of wine, or lemonade, and just read and relax and look at the lake, fish, take walks in the woods, etc. While having one of those talks, we received a call from our pastor…. Our church was going to be having a revival in September. September 22 (2012) it would start. It was just a few weeks away. Our pastor told us that the speaker who was coming was hoping for a place to stay that was secluded, so that he could focus and have some alone time, rather than stay in someone’s home. In our town, there are no hotels or motels. The nearest lodging is in the next town, 20-30 minutes away. So, the only option the speaker would normally have was someone’s house. The pastor asked if we’d have the Bed and Breakfast ready by then. To us, this was another God-wink. We said yes…we could. We had just been wondering whether or not anyone would want to stay in such a secluded place. The answer was yes. The date was quickly approaching…would we ever get it done in time? There was mess all over the place that needed to be cleaned up. The gate for the loft still needed to be painted. I gave the red paint to Reese and told her to go paint the whole door red. I came out to check on her a bit later, and this was her creation. My heart melted. 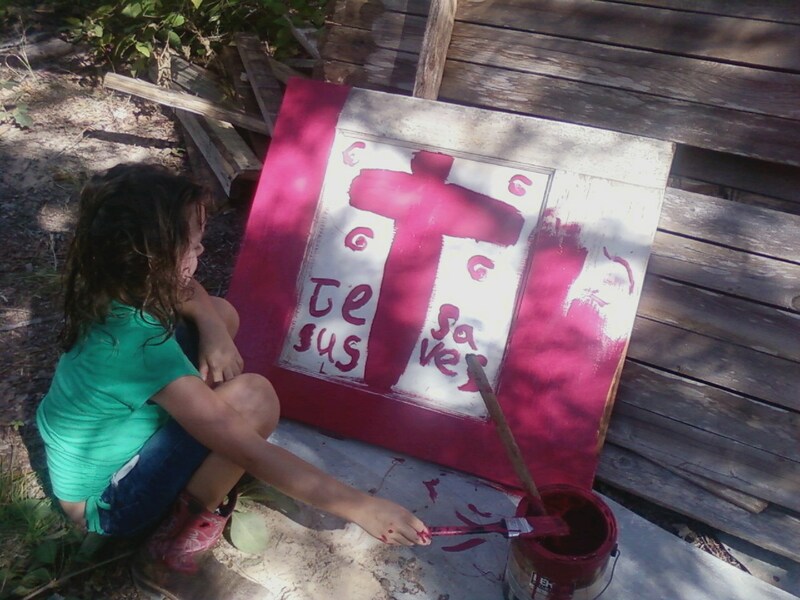 I would have had her keep it as is, but an unexpected visitor came by to chat (we had TONS of those), and while chatting, she finished painting it all red. I’m just thankful I got the picture before she finished. It says “Jesus saves.” Precious. Before we knew it, MOVING DAY was upon us! We moved in the furniture. This was another God-wink…. 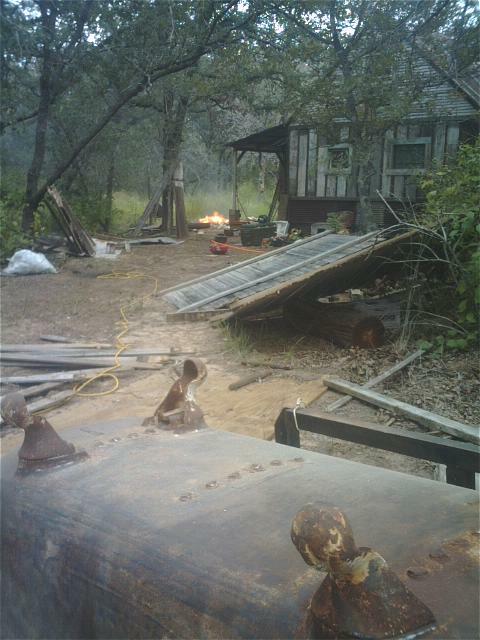 Around the time that we first bought the land, and were waiting for the electrical company to come, and well diggers to come, I received a call from my mother. She told me that my sister was moving that day, and never would have wanted to ask me to help, but probably needed it. So, Steve and I headed over to her house to assist her. She has Lupus and Fibromyalgia. It’s very hard for her to move. Sure enough, hardly anything was packed and ready, and the movers would be arriving any minute. So, my kids, Steve, and I rolled up our sleeves and started packing boxes. Just as we finished, the movers arrived and started pulling out the furniture. Once we arrived at her new house, we helped guide the movers, telling them which boxes and furniture to put in which rooms. My sister was worn out. At the end, the movers told us that there was no more room for all the furniture. She had down-sized, and didn’t have enough space in the new house for all her things. So she pointed out which items to take out to her garage. Steve and I came the next day with our trailer and loaded up all the furniture that she could no longer use. For the meantime, we stored it in our garage, until we’d have time to deal with it later. Little could we have known…. Just a couple weeks before finishing the Bed and Breakfast, I found myself wondering how we could afford to get a refrigerator and furniture?? 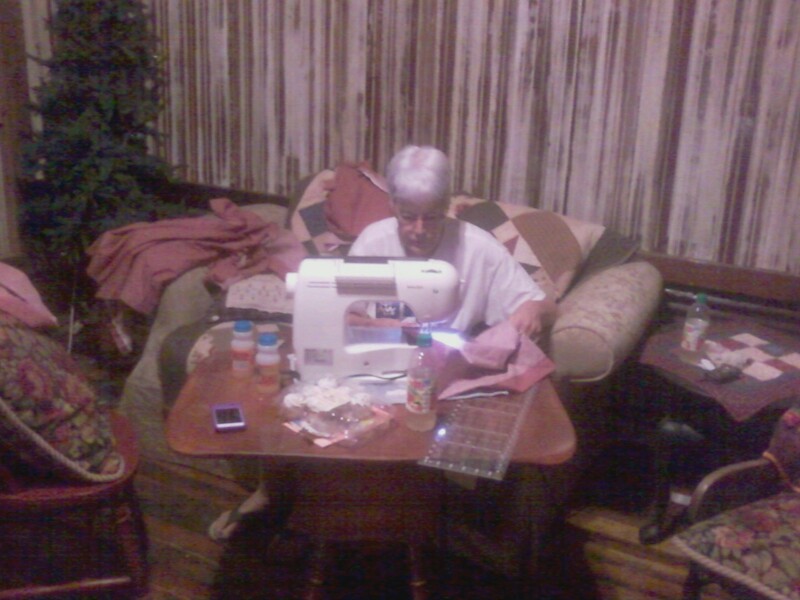 Around this time, my mother-in-law retired from her quilting shop business, and had a spare refrigerator. She gave it to us. FREE. Then, Steve remembered the furniture we were storing in our garage, and wondered if any of it could be used here. 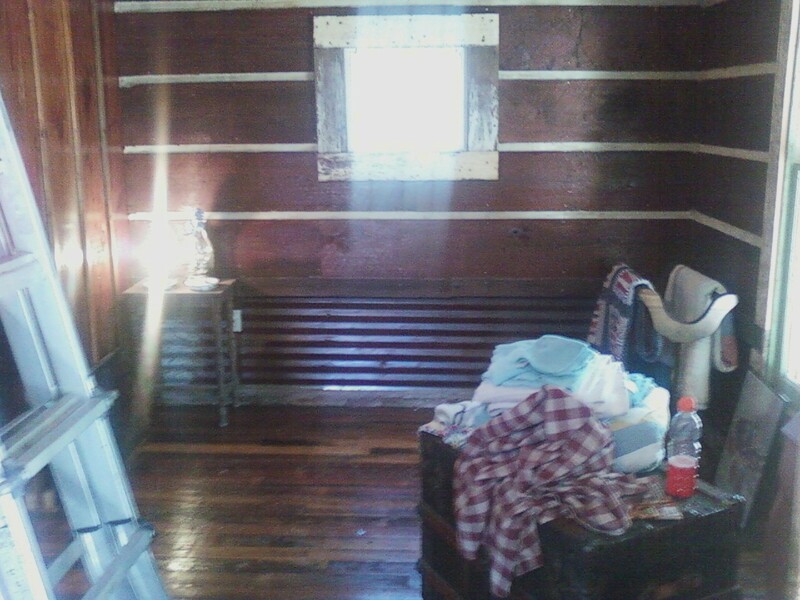 The couch, tv, tv table, rocking chairs, side table, armoire, lamps, etc were ALL from my sister’s house…free. My mother-in-law had a spare bed and bed frame that she no longer wanted. 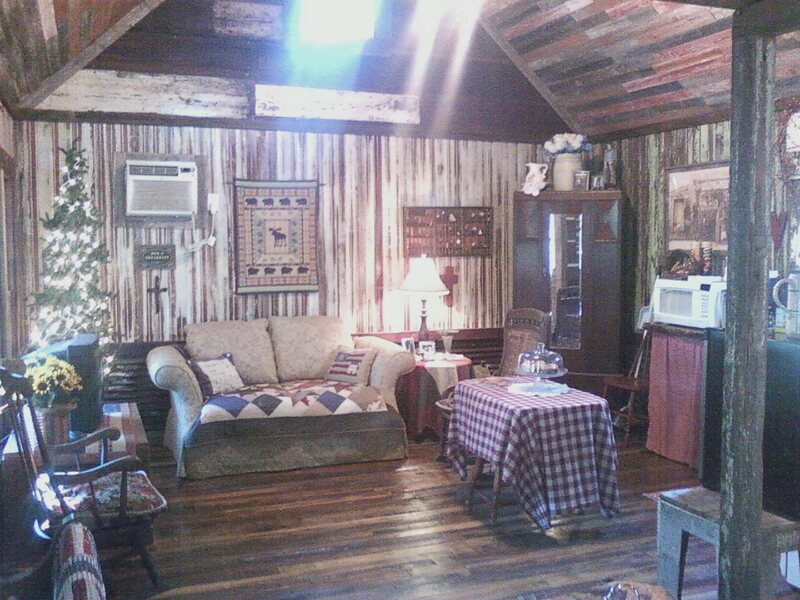 Once again…God provided everything we needed to complete the Bed and Breakfast. 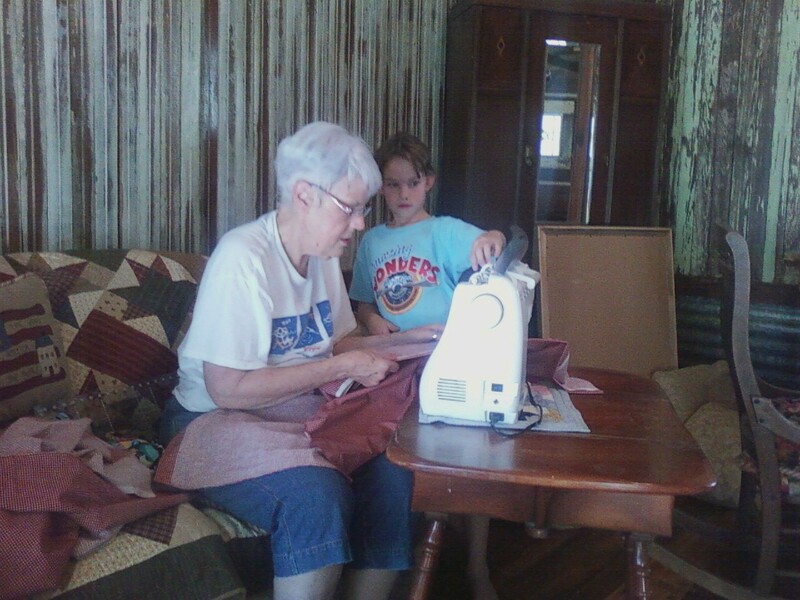 My mother-in-law brought in her sewing machine to sew curtains with the girls. 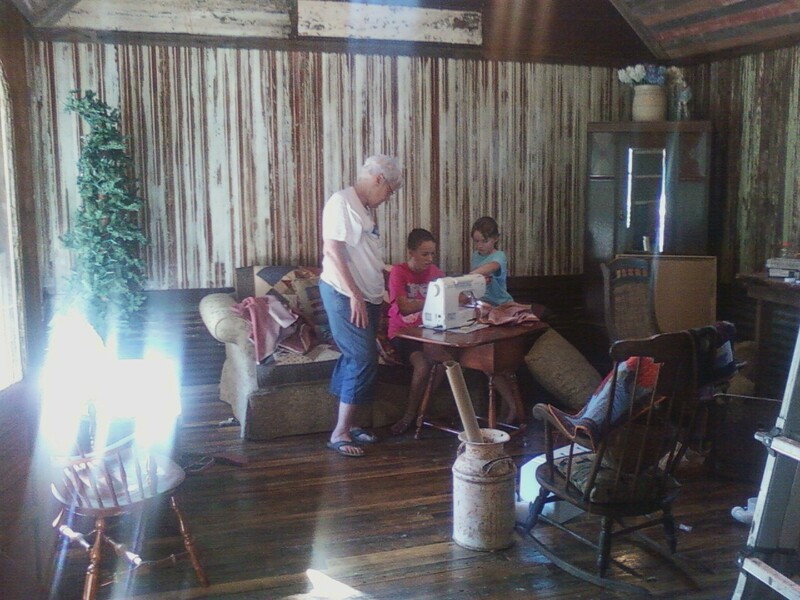 There are the girls sewing, and our stuff EVERYWHERE. Oh good! More MESS!!! 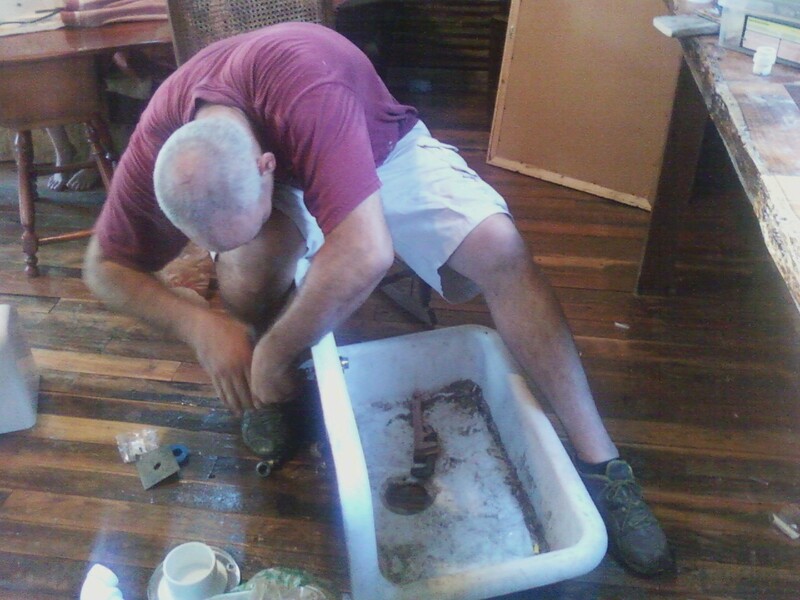 Steve plumbed the kitchen sink. Do you remember this sink?? 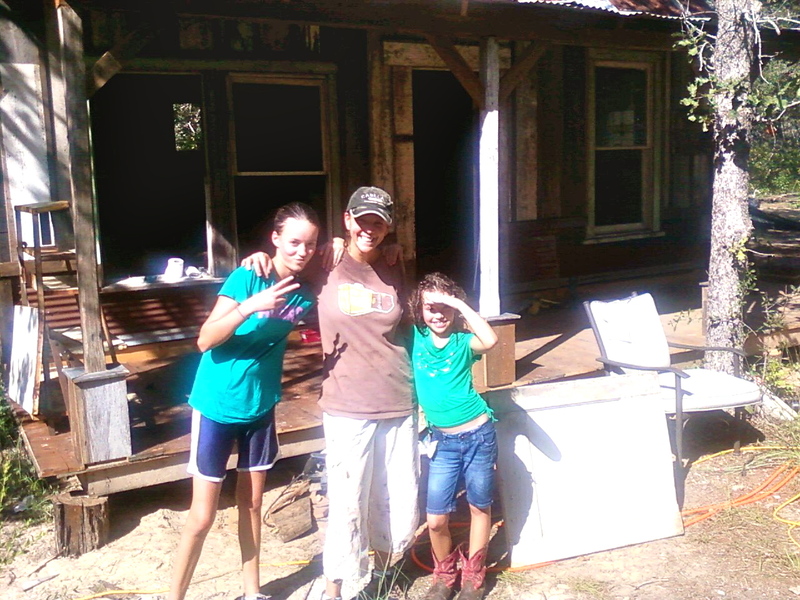 In the first post called “Welcome to Cottonwood Creek”, I told you that we had helped a woman from our church tear down her condemned barn. 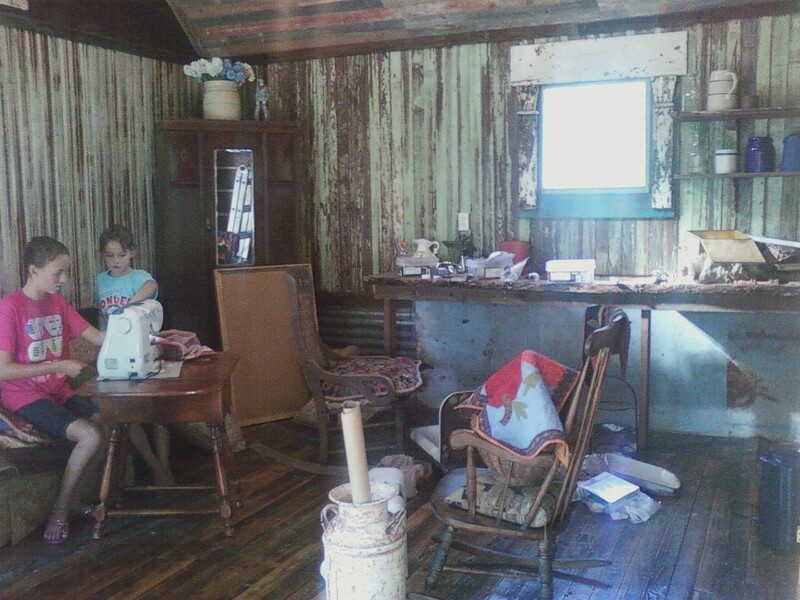 She was living on only a few hundred dollars a month. 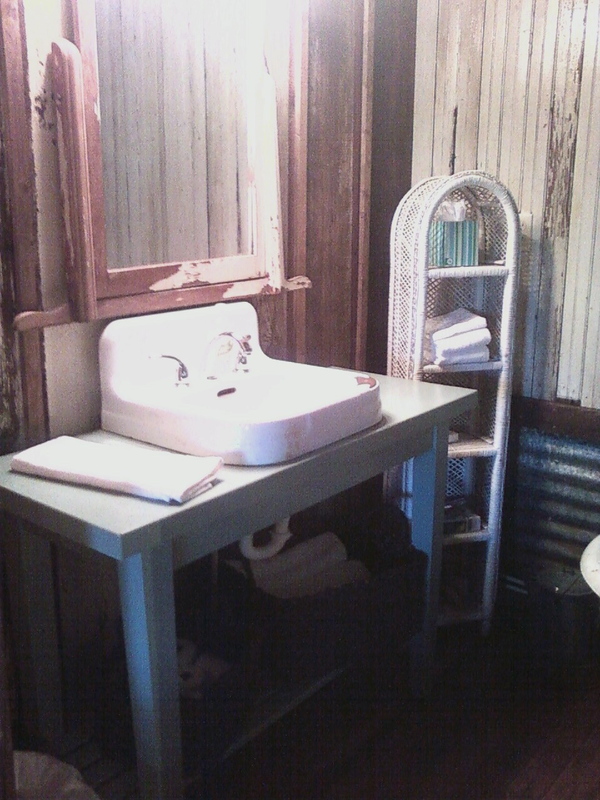 We wanted to help her out, so we bought the sink that was in it, along with wood and other things that she didn’t need. We had no idea what we were going to do with any of it; we just wanted to help her out, and liked the stuff. Little could we have known that only months later we’d be building a structure to put it in. Things were finally getting down to the nitty gritty. Only a few days to go, and we weren’t ready yet!! 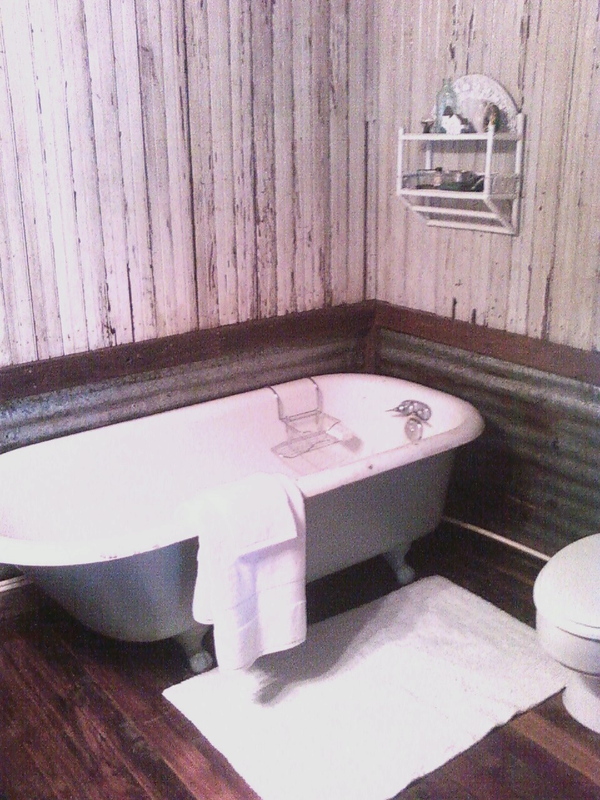 No toilet, no septic, no tub plumbing…no water to clean with. Was it possible??? During this last week (or days) of crunch time, friends came and came. Gina and Charlie came out again. Charlie was irreplaceable in helping Steve plumb the bathtub, sinks, and installing a septic system, and hooking it up to the toilet. Gina put her gloves on, and she was raring to go. 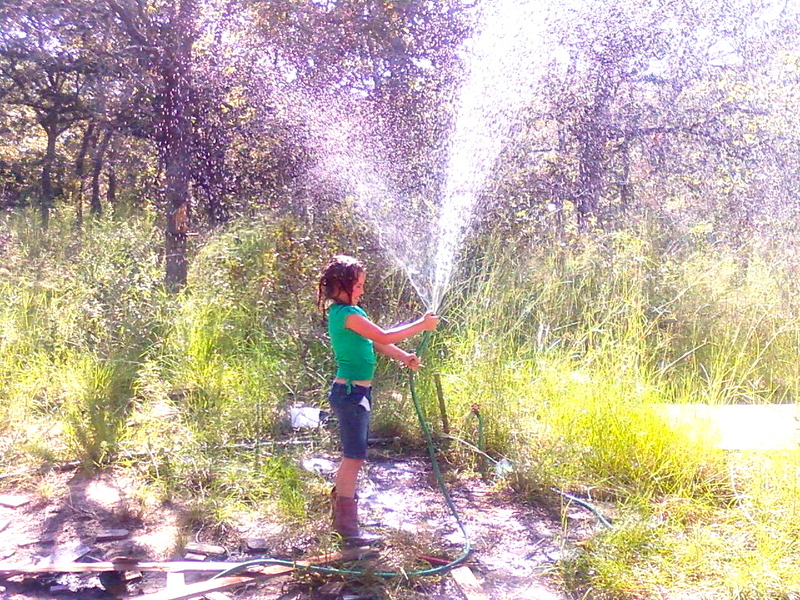 She and I made countless trips back and forth from piles of wood to the fire, cleaning up the property outside. 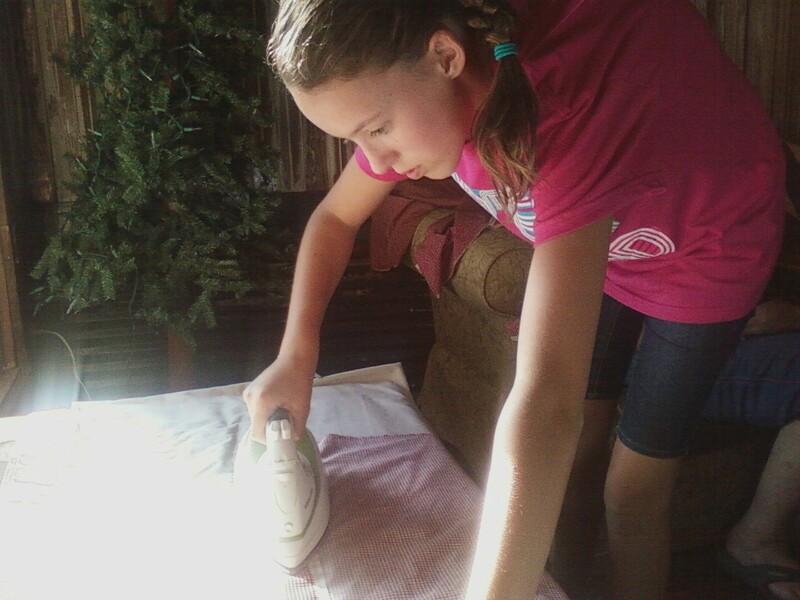 She washed the windows, helped me haul away things, cleaned off the whole front porch, and much more. Bless her cooking heart…she even brought fresh baked brownies for us. 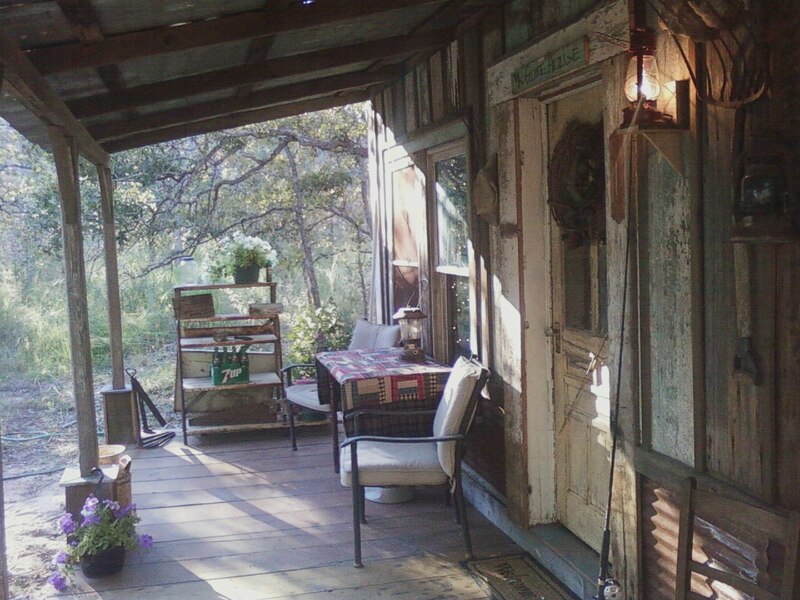 Our friend Kristy came out to bring me perfect decor items for the cabin and the porch. 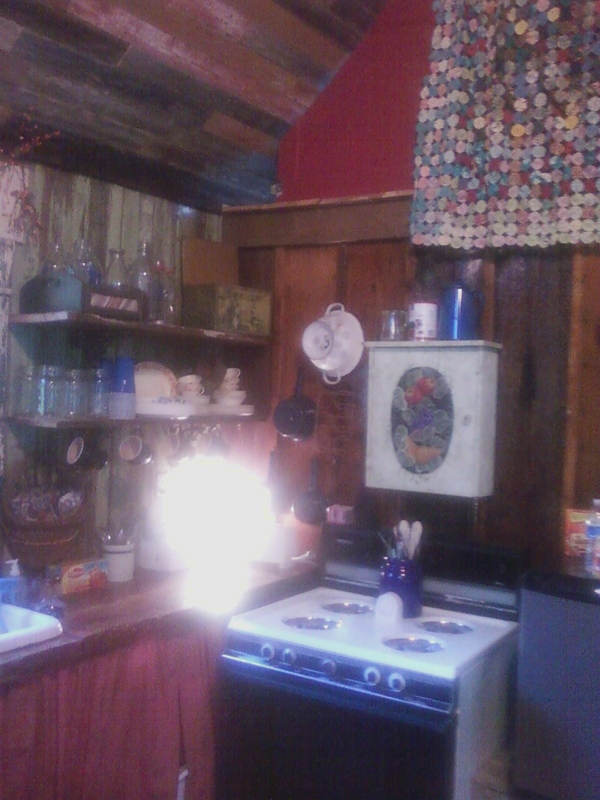 She gave us an old lantern, an old heater, vintage soda bottles in their vintage box, an antique pitcher with bowl, and more. She even cleaned the oven inside and out that hadn’t been cleaned well in years. The pastor came out. He put away all of Steve’s zillions of tools, trimmed our bushes and cut down a tree trunk that was damaging cars as they entered our driveway. 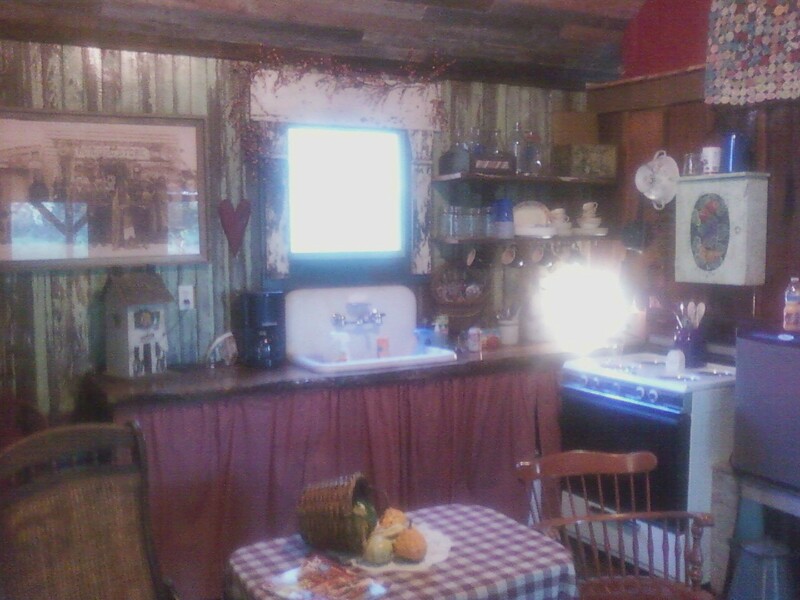 My mother-in-law, Dixie, went shopping with me for the basics and fun stuff, and spent two days decorating and helping clean. Pat came out (who grew up in the house), bringing us a porcelain table that used to be in the home, and absolutely loved the house. All of them hung up pictures on the walls for us, did last minute plumbing repairs, helped outside with whatever needed to happen. It was so special to be sitting in there, at 8pm the night before the visiting preacher was coming, sitting around the living room together, laughing, and chatting…and working hard towards trying to finish. It meant so much to me to see this cabin meaning so much to them, as well. God is SOOO good. At this point in time, my head was spinning. I was pulling over 12 hour days of hard labor every day, in the heat. I was too tired to think clearly, and so dearly appreciated these friends coming out and just getting the job done for me and with me (and Steve). We NEVER could have done it without them. On the very last day…THE day that the visiting pastor was going to spend the night in McGuire House….we weren’t done yet!! Steve was at the fire station. Reiley, Reese and I got there at 7am. 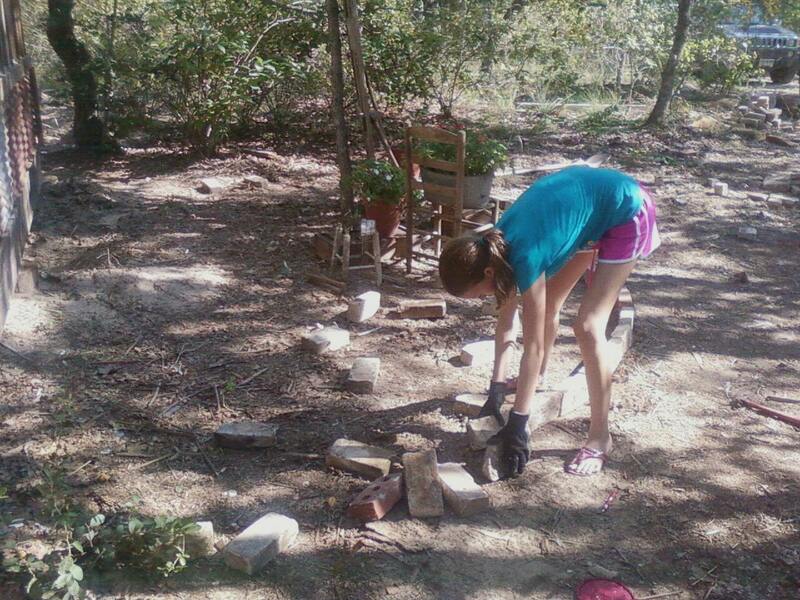 We started cleaning up what was left of the wood, cleaned up the trash, painted signs, created a garden (here’s Reiley laying the bricks around the garden), cleaned inside, and more. 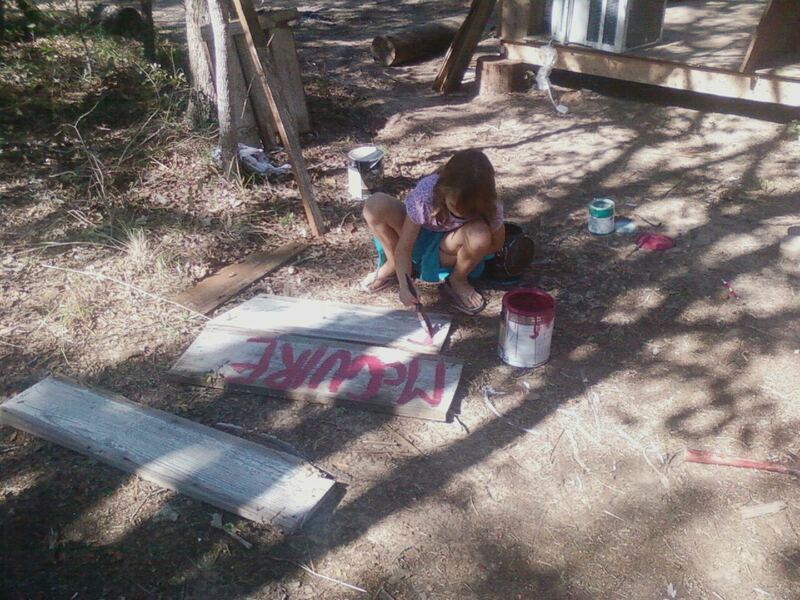 There’s a picture of Reese painting the signs. Can you see the air conditioner still sitting on the porch, wood still standing around, and no step built…just in this picture? As of noon, the a/c was not installed, the sinks were not ready to use, we had to hook up the water heater, had to build a step for the porch, had to fix the doorknob on the front door, install a motion detector light outside, put a flusher handle on the toilet, and more. The pastor was supposed to be there by 3. Our friend Shawn and his wife (he helped tear down the house back in the first posts), and Randy and his wife came out to see us at 2. We had one hour left, and I was looking at a total mess, no step made, saw dust all over floor, kitchen sink not draining right, and more. Stressful? Steve finally got home, and he and Shawn knocked out the step in no time at all. Randy’s wife, Emma, headed straight to the bathroom and cleaned my sink for me. When they all left, I called our pastor and asked if the guest preacher could wait a couple more hours before coming. He said no problem. He would bring him over at 8. At this point, it was 3. By 7:00, we were finally done. DONE!!!! ALL DONE!!!!!!!!!! It took every single ounce of energy from all four of us…but, by golly, we did it. Here are the final pictures. 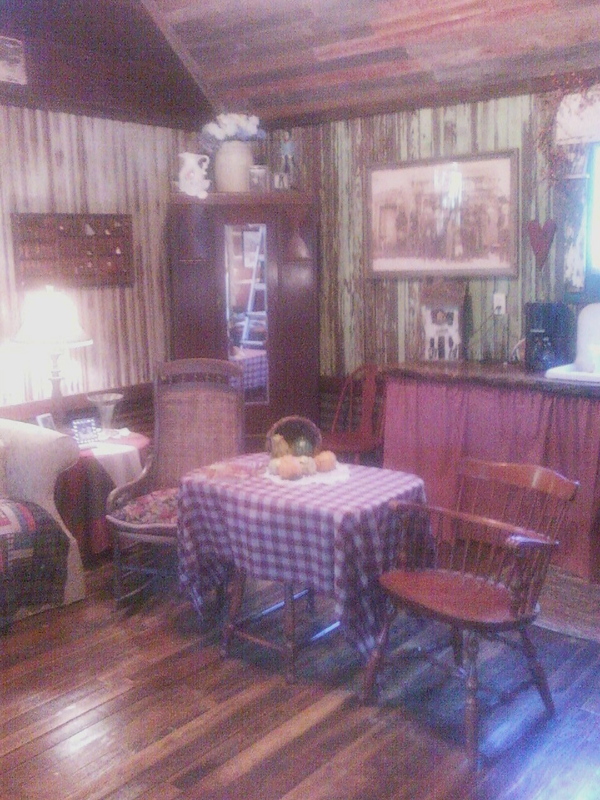 Welcome to Cottonwood Creek’s McGuire House! 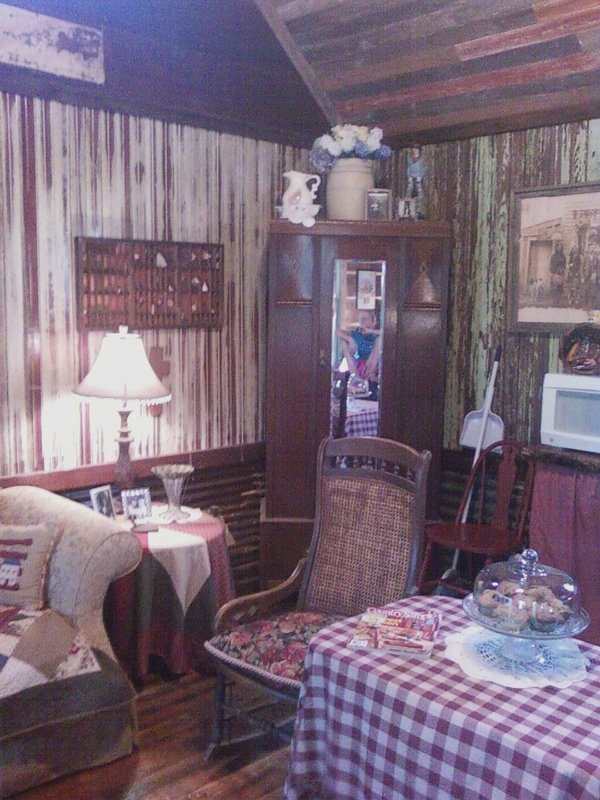 I didn’t include pics of the loft bedroom. I will post that up soon. It has two twin size beds in it. (Disregard the ladder in the pic. I had to get the pic before it got dark). 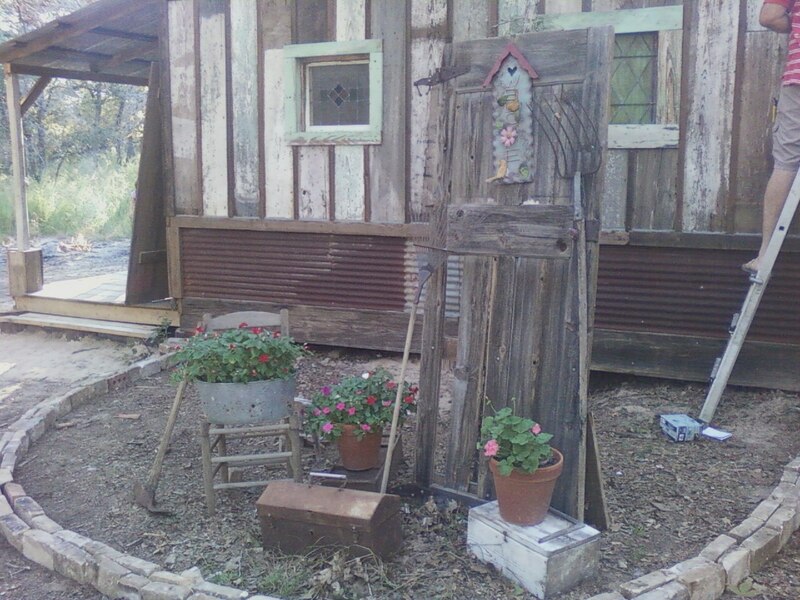 The door in the garden was the original front door of the home…over 100 years old. The tools and tool box were Pat’s daddy’s. The guest pastor arrived at 8. Out the door I went. Finally. Or, click on Welcome to Cottonwood Creek to start from the beginning of our story. Or click on “What is Cottonwood Creek” to find out what in the world this blog is about?? Posted in Bed and Breakfast, christianity, construction, faith, family, inspirational, jesus, UncategorizedTagged bed and breakfast, fredericksburg, gas lanterns, God-winks, tee peeBookmark the permalink. Wow Bradbury’s! Simply amazing! God is good. Gretchen it is such a blessing to read about this adventure and how God had such a hand in it.Thank You for sharing this belssing with everyone.